Here is a card I did for this week's sketch challenge--SC126. They post a card sketch challenge each Wednesday, and everyone posts their take on the sketch. This one was very simple, but loads of fun!! Be sure and check them out on www.splitcoaststampers.com. 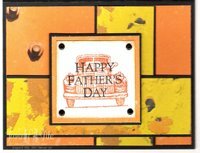 I started with a basic black card base, then layered the orange designer paper from Relics. The yellow paper is also from Relics--I cut strips then layered those on black. The truck (from Classic Pickups) is stamped in Pumpkin Pie, with the sentiment (All Year Cheer II) stamped over it in Basic Black ink. I layered that onto Pumpkin Pie cardstock, then onto Basic Black cardstock. I added four black brads from the Vintage Brads to the corners. I love the way it turned out!!! Here is another Diva Night Project!! Not much stamping involved--just the big flower from Looks Like Spring! 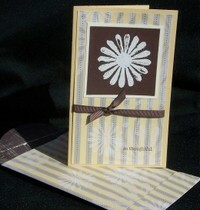 It was stamped with Vanilla craft ink, then embossed with vanilla embossing powder. It really stands out on the Chocolate Chip paper!! 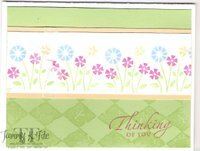 I used the Spring Flowers Designer paper with the 5-n-1 Card template! Very simple project, but I think it turned out nice!! We'll be doing a similar project in the class I'm offering in June! 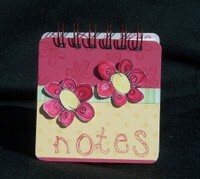 You can visit my website for more details: www.tammyfite.stampinup.net. I finally took some pictures!!! I had a few projects that weren't "scan-able", so I had them in the "take a picture of.." pile!! Anyway, I finally took a few minutes this afternoon and snapped some pics!! This is a small notebook made from 4"x4" chipboard coasters!! I also used my new toy--the Bind-it-all!! I got the machine, the wire bindings and the chipboard coasters at Eclictic Paperie. This is a new business started by two of my internet friends, Joy and Daisy. They are the sweetest ladies, not to mention VERY talented!! Be sure and tell them I sent you! This is a project I designed for my Diva Nights in May. I host these fun evenings for my downline--they earn projects through sales, recruiting, and other "challenges". They then come and make some fun projects at my house. I used my Doodle This, Doodle That and Doodle Alphabet on this project. All these can be found in the Spring Mini Catalog. (need a copy? just email me!!). The Certainly Celery and So Saffron pieces are from the Palette O'Prints--on special now for $9.95 with a $35 purchase. (but only until May 31) You can check out my Stampin' Up! here for more details! I stamped the flowers in Black Stazon, then watercolored using Rose Red and So Saffron. 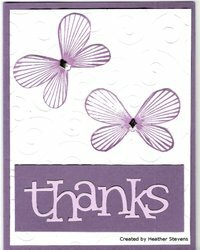 I cut them out and adhered them using Stampin' Dimensionals. For the inside, I just cut up some computer paper. I was really happy with the way it turned out!! Hi!! Here is a card we did at the May Card Club!! I really love this card, which must be why I've featured it twice!!! Yep, one of the girls in my club sat down to do this one, and said, "Haven't we done this before?"!! Well, in my defense, it hadn't been done at the Card Club, but it had indeed been one of the cards at one of my Stamp-a-Stacks!! Oh well, what can I say!! I am over 40--can I use that as an excuse? haha!!! P.S. If you're interested in joining a stamp club or card club, please contact me for details!! I have several starting up in July!! Good morning!! Here's a card that I received from my wonderful upline, Sherrie!! She is so talented! 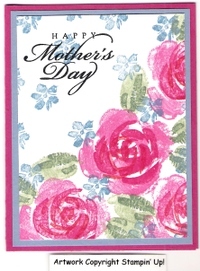 This card is made completely from the Friends & Flowers Simply Scrappin' Kit!! This kit is a Level I hostess set in the current catalog! The colors are wonderful--great even for boys!! I've had alot of fun with this kit! Have a great Sunday! Happy Stamping!! Here is a card we did at a past Card Club meeting. The colors aren't quite right in the photo--I think I need to take a class in digital photography!! Anyway, you get the idea! I did CASE this card from a swap card from a long time ago. It's always been a favorite of mine--just love the colors! And, you can add any sentiment to it--it's very versatile!! 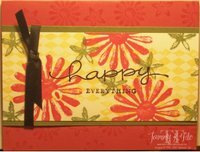 Looks Like Spring and Happy Everything stamp sets. I was so excited when I checked mail today!! I actually got this beautiful card from Heather Stevens!!! She is a SCS Blogger, and you can check out her blog here. I love getting something other than bills and/or junk mail!! And, when it's such a pretty card, it makes me even happier!! Thanks, Heather!!! Good evening!! Just wanted to take a minute to post a card we did Friday night at the Card Club!! 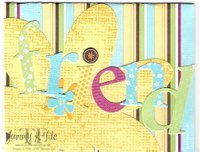 I used a layout I had seen from cruise--a card that Shelli had made using the "You Make Me Happy" stamp set from the Spring Mini Catalog. I don't have that set (believe it or not! ), so I substituted the "Mixed Bouquet" stamp set! Cardstock: Certainly Celery, So Saffron & Whisper White. The patterned paper is from the Palette 'O Prints that is on special this month. It is a beautiful pad of paper--great colors, great patterns, and very versatile!! Hope you're all enjoying the rain!! Good morning, and Happy Mother's Day!!! This is a card we did at a class. I just love this set, and will really miss it in July when it's retired. I'm off to four baseball games now! And, it's so worth it!! My oldest wrote in my Mom's day card, "It means so much to me to hear you in the stands cheering". I cried! Good morning!! I am trying to plan some projects for the sixth graders at my son's school, and I somehow came up with this frame of my two handsome boys!! Okay, so I got a little off track!! haha!! I made this using the cardboard coasters (like the ones you get at restaurants). I covered them in Au Chocolat designer paper, then layered the pictures on Rose Red and Certainly Celery. The heart is from the Doodle That stamp set.